Decibel Magazine is hosting an exclusive stream of “Shrouded And Veiled” by Portland, Maine-base black/thrash metal outfit SHABTI – founded by current/former members of Falls Of Rauros, Obsidian Tongue, Panopticon’s live lineup, and more. The song is the lead single and opening track to the band’s impending second album, Trembling And Shorn. Trembling And Shorn was tracked by Todd Hutchinson at Acadia Recording Company, mixed by Dave Kaminsky at Studio Wormwood, mastered by Colin Marston at Menegroth, The Thousand Caves, and completed with grim cover art by Unexpected Specter. The record will see release in cooperation with Last Mercy Emissions as the band tours the Northeast US with the likes of Churchburn and others in March. Stream SHABTI’s “Shrouded And Veiled” only at Decibel Magazine RIGHT HERE. Trembling And Shorn will manifest as a limited run of 300 CDs and be released through all digital platforms on March 22nd. Preorders are available HERE. Watch for additional audio samples from the album and more to be released in the weeks ahead. 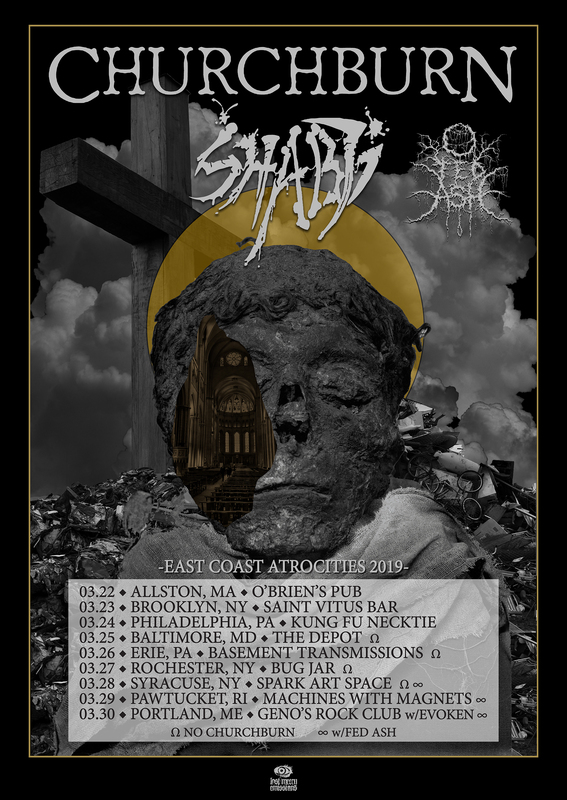 SHABTI will be on tour beginning March 22nd, partially with Providence death/doom outfit Churchburn as well as Syracuse-based noisecore act Fed Ash, with Scaphism, Unearthly Trance, Sunken Cheek, Haxen, and others also playing on select dates. The tour ends March 30th with a hometown show in Portland with funeral doom lords Evoken, Churchburn, and Fed Ash. The tour admat was designed by Ethan McCarthy of Primitive Man/Cool Ghoul/Many Blessings. 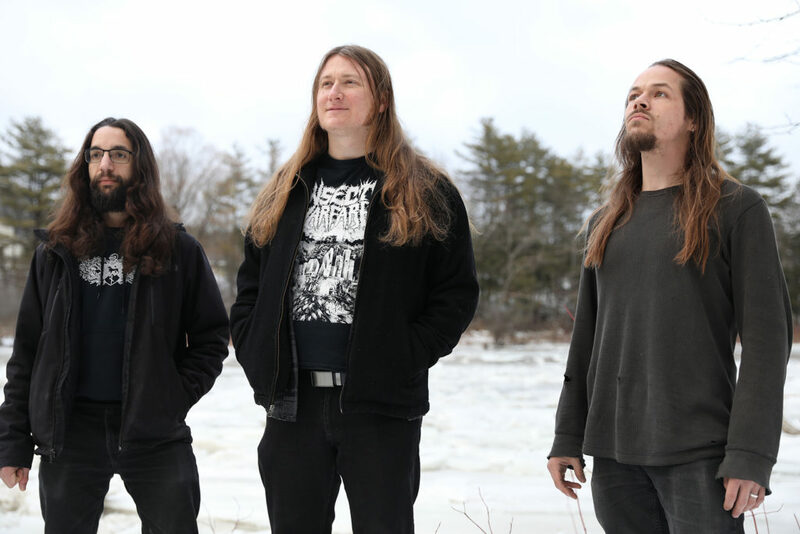 SHABTI has been steadfastly crafting their brand of brooding technical black/death metal since emerging from the thaw of the Maine winter in 2008, eschewing gimmicks, trends, and posturing, in favor of focusing on more direct sonic pursuits. Subsequent years saw the release of two demos and the 2013 full-length, Paracusia. After several years and permutations, in 2015 the lineup finally coalesced to feature Ray Capizzo (Falls Of Rauros, Obsidian Tongue, Feral, Panopticon live) on drums, Brendan James Hayter (Obsidian Tongue) on bass, and founding member Rob Cook on guitar and vocals. Over the years, SHABTI has played many live shows throughout the Northeastern United States with bands such as Absu, Today Is The Day, and Primitive Man. SHABTI’s long-awaited second full-length Trembling And Shorn deploys forty-two minutes of precisely calculated and savagely executed blackened death, a gauntlet of technical razor wire riffs delivered with the percussive force of an armada of warships, the bands influences of Dissection, Death, Morbid Angel, and Carcass boiling just below the surface at every turn. Trembling And Shorn is a blistering album fans of Absu, Aura Noir, Marduk, Ceremonial Castings, 1349, and Watain should experience.